KROQ, Travis Barker and John Feldmann come together to announce Back To The Beach--a new weekend destination festival featuring some of the biggest names in modern ska, punk and reggae--debuting April 28 and April 29 on the sand at the world famous Huntington State Beach, in Southern California. 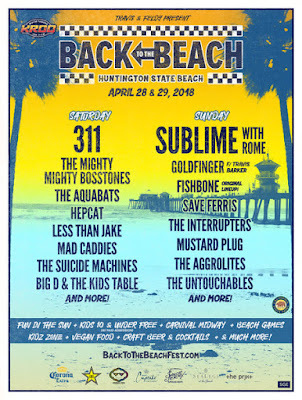 Back To The Beach will feature performances from 311, Sublime With Rome, The Mighty Mighty Bosstones, Goldfinger (featuring Travis Barker), Fishbone (original lineup), The Aquabats, and many more performing on the shore of the Pacific Ocean in picturesque Orange County, California. There will be special surprises announced in the coming weeks. Back To The Beach is produced by Synergy Global Entertainment (SGE), blink-182’s Travis Barkerand Goldfinger’s John Feldmann. Tickets now on sale at backtothebeachfest.com. A limited number of VIP ticket package options are available (see below for details). For this family friendly event, kids under 10 get in free when accompanied by an adult with paid admission. This is an all-ages event. Back To The Beach will feature a carnival midway, beach games, the Lil' Punk Kid Zone, vegan food, craft beer and cocktails, and more. General Admission tickets and VIP ticket packages for Back To The Beach are available for purchase. Comfortable shaded areas to sit and relax, games and more! Comfortable shaded areas to sit and relax, games, and more! Back To The Beach partners include: Rockstar Energy Drink, Corona, Sailor Jerry, Cosmic Fog, SeaLegs Wine Bar and Cupcake Wines.